Superbowl XLIX will go down as one of the more exciting and controversial Superbowls ever. It may also be remembered for spawning more federal trademark applications (eight, by my unofficial count) than any other in history. The trademark party got started during the lead up to the game, when famously enigmatic Seattle Seahawks running back Marshawn Lynch told reporters “I’m just here so I won’t get fined.” Lynch, fresh off his newly trademarked “BEAST MODE” moniker, which he secured rights in last year and subsequently spun into a clothing label of the same name, trademarked the sentence and now prominently features it on some of his apparel. Sports stars have trademarked catch phrases before. Darrelle Revis with “REVIS ISLAND” and Pat Riley’s “THREE-PEAT” come to mind. So does Lynch’s own teammate, Richard Sherman, who has a federal registration for “U MAD, BRO”. But none have turned trademarking into the art form that Lynch has. With his latest entry, he will soon be the proud owner of at least twelve different trademarks on the USPTO principle register. As far as “I’M JUST HERE SO I WON’T GET FINED” is concerned, it will be interesting to see how Lynch intends to use the mark going forward. While it may make for a catchy line to sell some t-shirts now, it’s unclear how the esoteric phrase will operate as a viable trademark over the long run. Any sentence can be silkscreened on a shirt, but that doesn’t make it a trademark. A trademark must be used in connection with specific goods or services, and serve to identity the source of those goods or services. It has to be more than merely ornamental. If it shows up on a shirt it must represent or identify the source of that shirt (i.e. 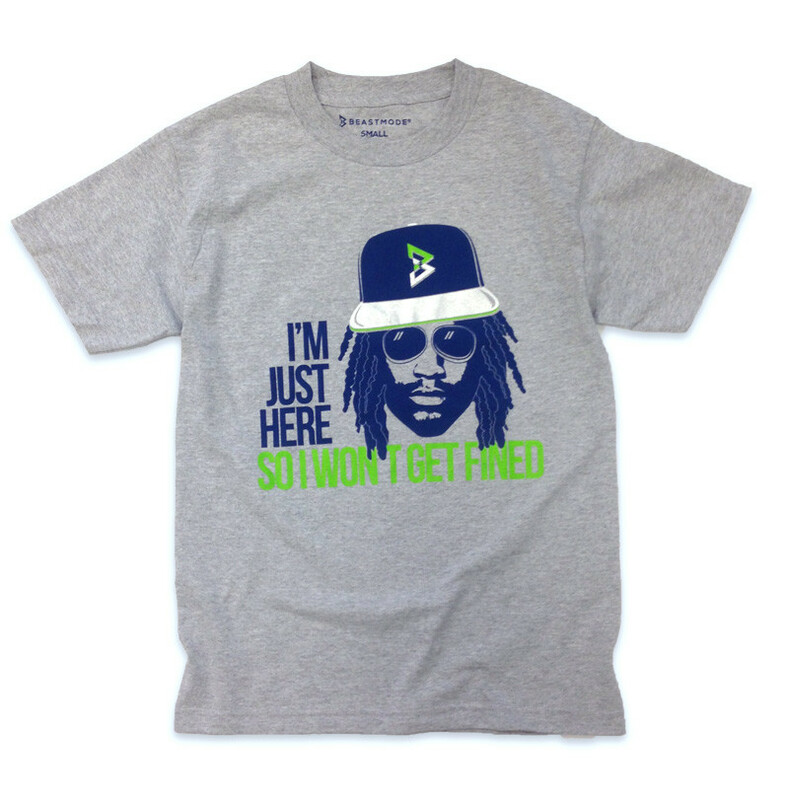 Lynch himself or his Beast Mode apparel company). And this line seems a bit too clumsy, not to mention transient, for that. It’s a point that athletes would be well-served to consider before racing to the PTO to file. While it may be trendy at the moment to trademark sports catch phrases, a trademark has no legal effect, and is therefore worthless unless it’s used properly…as a source identifier. The other trademark story at this year’s big game came courtesy of pop singer Katy Perry and her company Killer Queen, LLC. This one didn’t stem from anything Ms. Perry said, but rather something one of her backup performers did during her Superbowl halftime show. 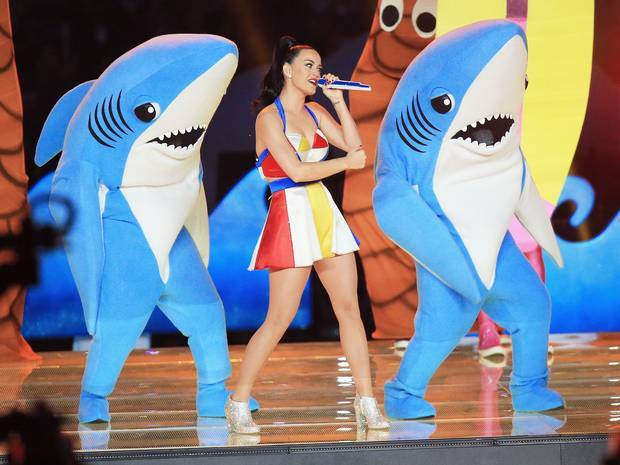 You see, Ms. Perry’s beach-themed routine featured, among other things, a duo of dancing sharks. And one of those sharks (coincidentally the one to Perry’s right, not left) happened to be singled out on social media for being slightly out of step with her choreographed dance number. That’s all it took for ‘left shark‘ to become an overnight Internet sensation, unleashing the great American meme machine and permanently enshrining it in the pantheon of American pop culture references alongside such other notable entries as jumping the shark and shark week. It also prompted Ms. Perry to file seven (count ’em seven) trademark applications a few days later—three for the design of the shark itself (the actual designs submitted to the PTO are pictured above) and one each for the terms “LEFT SHARK”, “RIGHT SHARK”, “DRUNK SHARK” and “BASKING SHARK”. You can’t make this stuff up. The four word marks are on their way to becoming registered trademarks for stickers, mugs, cellphone covers, apparel, toys, and of course live music performances. That’s good news if you’re worried about the exclusivity of your official left shark body suit being sullied by tasteless imitations. Unfortunately for Ms. Perry though, the visual shark designs her company submitted to the PTO bore little resemblance to the specimen they attached—a photo of Perry on stage with the actual shark (pictured below), leading the PTO to reject the three design marks on the grounds that they did not, as presented, function as trademarks. In other words the specimen not only didn’t match the design, but it didn’t depict a use that suggested Perry or Killer Queen was the source of the claimed goods and services. The design was, according to the PTO, merely ornamental. Perry’s company is welcome to revise the designs and the specimens and resubmit the application, but for now the fate of the left shark design mark is in murky water. Katy Perry’s company may be called Killer Queen, but when it comes to pop singers playing the trademark game in 2015, the crown goes hands down to Taylor Swift, who’s playing it like no other artist before her. In fact, if any celebrity could one day be pointed to as the catalyst for a pop culture trademark inflection point, it might very well end up being Swift, who, in addition to having prior existing federal trademarks on her name and initials, has been busy trademarking song lyrics in advance of her 1989 World Tour, which kicked off in May. How busy? She’s applied for a whopping fifty-eight new trademarks to be exact, and if they all proceed to registration that would put her total at a dizzying 108 active trademarks on the principle register—a number that puts even Katy Perry’s tally to shame. To put that number into perspective, America’s most famous fast food chain of the last fifty years—McDonald’s—has 400. Why is this significant? Artists securing legal rights in their songs is nothing new, you say. Actually, Ms. Swift’s intellectual property strategy to profit from her fame is unprecedented. Because while singers have always relied on copyright laws to protect their songs and lyrics from exploitation by others, this represents the first time a singer has actively sought en masse trademark protection for parts of songs. Those parts, in case you’re curious, include the lines “THIS SICK BEAT”, “PARTY LIKE IT’S 1989”, “NICE TO MEET YOU”, “WHERE YOU BEEN” and “SWIFTSTAKES”. As with both Perry and Lynch, it remains to be seen how Swift will use these new marks. Most were filed on a 1B basis, which means that at the time of their filing there was only a bona-fide intent to use them in commerce, not an actual use. But an initial review of her filings indicates she intends to use them in connection with a wide variety of goods; everything from home furnishings to musical instruments, and from Christmas tree ornaments to luggage. So merchandising obviously plays a big part in her strategy. Many in the music industry are curious to see if Swift’s attempts to enforce her massive new bounty of trademarks will lead to disenfranchisement among fans. There’s already been some backlash among amateur artists, however misguided and uninformed it may be, accusing her of limiting freedom of speech and artistic expression. There also seems to be some concern about a trademark blitz causing Ms. Swift to be seen as a profiteer first and a serious artist second. But really, what high-profile singer isn’t about the bottom line these days? Especially the ones who cater their craft to the 18 to 24 demographic. While any damage to Ms. Swift’s reputation is merely hypothetical at this point, the practical result of having this many trademarks controlled by the Taylor Swift brand is a clear sign that big-name musicians are increasingly looking to alternative revenue streams like licensing to supplement album sales, music downloads and ticket receipts. It also speaks to the popularity of peer-to-peer e-commerce sites like Etsy.com, where fan art and handmade crafts proliferate; and to the perceived threat they pose to the entertainment industry. From that perspective this would seem to be part of a concerted effort on the part of Swift to crack down on these kinds of sites. Registrations tend to make it much easier for takedown notifications to stick, because sites dealing in goods of questionable legality tend to stand up and take notice when they receive cease and desist letters that include proof of federal trademarks. Finally, the world of college basketball is responsible for adding new meaning to the term: trademark defense. It happened last month, when Shaka Smart, the long time up and coming coach of the Virginia Commonwealth University (VCU) men’s basketball team was hired away by the University of Texas to coach their program. Smart, who year in and year out was among the most coveted candidates of schools looking to fill head coaching vacancies, is famous the world of college basketball over for his relentless brand of ball-pressure defense; an aggressive style of play he nicknamed ‘Havoc’. On April 3rd, one day after Texas finally pried Smart away from VCU, the Texas Board of Regents submitted federal trademark applications for the terms “HORNS HAVOC” and “HOUSE OF HAVOC” for clothing and apparel, and sports and entertainment services. The clear attempt by Texas to co-opt the Havoc name for their own program was interesting on several levels. It obviously started a legal debate about who actually owned the rights to the name. But it also sparked a larger discussion about who really is (and should be) the keeper of a collegiate sports team’s brand identity; the coach or the university? Especially in light of the fact that incoming VCU coach Will Wade publicly stated his intent to continue the style of play that Smart had made famous. The complicating factor, from a legal perspective, was that VCU, while having registered “HAVOC” with the State Corporation Commission of Virginia, had never applied for a federal registration, thereby constraining its legal claim to the mark. (State laws confer some rights to trademark holders, but do not grant the broad legal protections of federal registrations). By every outward appearance this situation had all the makings of a contentious, high-profile legal dispute. But then, less than a month after the University of Texas filed its applications, it abruptly withdrew them. Apparently, for the good of both institutions, the two schools’ athletic departments got together and reached an agreement to halt the drumbeat of litigation. So for now “HAVOC” appears to still reside on VCU’s campus in Richmond, however the debate over which school has the legal right to use the term ‘havoc’ to identify its basketball team—or more importantly to prevent other schools from doing so—remains less clear. VCU’s state registration and its history of using the mark are certainly legally significant, but that doesn’t mean the Texas registration would have been unsuccessful; or that the school can’t develop its own common law rights in a similar form of the name without infringing VCU’s common law mark. Three conclusions can be drawn from this episode. First, someone in VCU’s athletic dropped the ball. If their intention was to retain the right to prevent other teams from using the term ‘havoc’ in the event Smart left, they should have secured federal rights in it. Second, while this may stop Texas from seeking to officially brand Longhorn basketball with the havoc label, it certainly won’t stop college basketball fans who associate the term with Shaka Smart from using it in reference to his new team. Ultimately the fans will be the ones who decide whether the ‘havoc’ association lies with the man or the school. And last but not least, it’s mildly refreshing that two non-profit institutions of higher learning can come together and agree that a protracted legal battle over a sports trademark is in neither of their best interests. What the Shaka Smart, Taylor Swift, Katy Perry and Marshawn Lynch examples (along with dozens of others like them) serve to demonstrate, is that the way we think about trademarks continues to evolve with the times. The laws themselves haven’t changed all that much. Despite several amendments to the Lanham Act (the federal statute that has formed the basis of modern U.S. trademark law for the last 70 years) the substantive law has remained relatively consistent. It’s how those laws are being applied, and the kinds of things they’re being applied to that has changed. And that’s less a comment about trademarks than it is about society. As our economy continues its secular march from manufacturing goods to delivering services; as real-world commerce continues to move to the virtual one; and as physical commodities yield to information as the dominant medium of trade, the currency of our day increasingly becomes exposure (measured by page views, click-throughs, shares, followers, and unique impressions). Information reigns supreme; and in the land of information the idea owner is king. So is it any wonder that trademarks are becoming less about protecting people from misleading labels on boxes, and more about people trying to stake claims to popular ideas? For better or worse people are turning to trademarks to claim ownership over the ephemeral; to give them something tangible they can call their own. But what many of them don’t realize is that it’s not the trademark that gives them that power. It’s how they use it. And that’s not going to change any time soon. Blawgs are usually unimaginative regurgitation of the latest case law developments, but you’ve actually crafted something informative and interesting to read. Well done. Thanks for reading and commenting. Stop back anytime!